DESCRIPTION: Iznik pottery motif inspired, zardosi hand embroidered, pure silk rectangular box clutch with a dimante clasp and long chain handle. COLOR: Fushia Pink. CARE: Store in dust Bag. Keep away from moisture. DIMENSION: 13 cm x 21 cm. 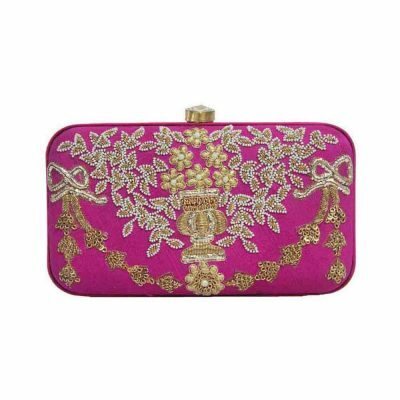 Traditional Turkish Tulip motif inspired, zardosi hand embroidered, pure silk square box clutch with a dimante’ clasp and long chain handle. Size: 17 cm x 16 cm. Collection: Travelogue. Color: Fuschia Pink. Care: Store in dust Bag. Keep away from moisture. Ottoman motif inspired, Zardosi hand embroidered, Pure silk square box SALtch with a dimante clasp and a long chain handle. Size : 18 cm x 19 cm. Collection : Travelogue. Color : Tangerine Orange. Care : Store in dust Bag. Keep away from moisture.